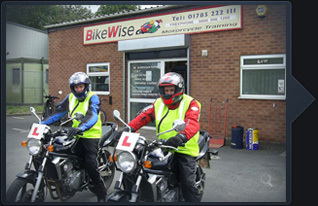 Why choose BikeWise in Stafford for your CBT training? There are several motorcycle training organisations to choose from, with varying range of costs, but ask yourself why go to a particular school, true, they all have instructors and motorcycles but what else? Here at BikeWise we pride ourselves on our professional, yet friendly, comfortable environment. Creating an informal atmosphere for all candidates. We only have qualified instructors for all aspects of tuition. Did you know that if you undertake a 125cc part two test you need not be in the custody of a qualified instructor? Here at BikeWise we welcome you to ask for our instructors ‘Certificate of Authorisation’, which has to be carried by all instructors whilst providing tuition. We believe that we provide true value for money, all tuition/courses can be booked and secured well in advance with just a small deposit. Ready to book your CBT? You are in Stafford and your closest motorcycle training school is BikeWise in Stafford or select another school by clicking below. To ensure you know were we are, you will find a location map and directions on how to get to us below (click to scroll down). Newport, Rugeley, Stafford, Stoke, Stoke On Trent, Stone, Tamworth, Tittensor, Uttoxeter, Weston, and more. We are always interested in what you have to say. Please feel free to leave a message with us here. We normally get round to all enquiries within 48 hours, however if you need to contact someone sooner call us FREE on 0800 996 1200. If you wish to make an enquiry to, please fill and complete the form below. These are only a few reasons why you should train with BikeWise. Why not arrange a visit? See the difference for yourselves, the coffee's always on the go. Here at BikeWise we pride ourselves on our professional, yet friendly, comfortable environment. Creating an informal atmosphere for all candidates. We only have qualified instructors for all aspects of tuition. Did you know that if you undertake a 125cc part two test you need not be in the custody of a qualified instructor? Here at BikeWise we welcome you to ask for our instructors 'Certificate of Authorisation', which has to be carried by all instructors whilst providing tuition. Now, we have all heard about the theory test. Well, not to worry, our candidates are more than welcome to pop in and practice the test on our computers. The official CD-Rom is available for you to use on site. We will even book the theory test for a time that suits you, and then your part two test on your behalf.